Software to easily manage department or employee time sheets! 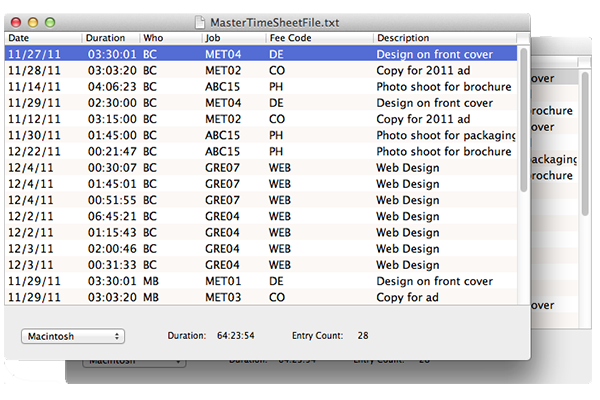 Merge, edit, group, sort, filter, print, and export all your employee time sheets. 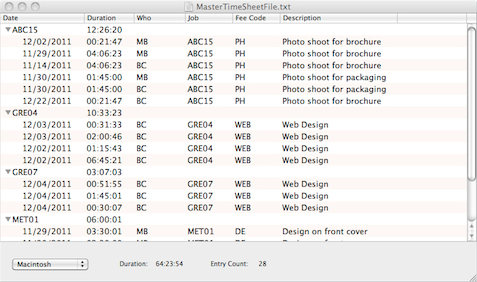 DesignSoft Time Sheet Manager software for OS-X and Windows is the perfect complement to the DesignSoft StopWatch Plus time sheet application. Developed for those who don't need a full featured billing or accounting application, it is a simple application to process time sheets created with DesignSoft StopWatch software. It's perfect for anyone from a single person enterprise to department managers responsible for time keeping and reporting employees' time. DesignSoft Time Sheet Manager imports your employees time sheets via any method; Email, peer-to-peer network, or any media. (see How it Works). 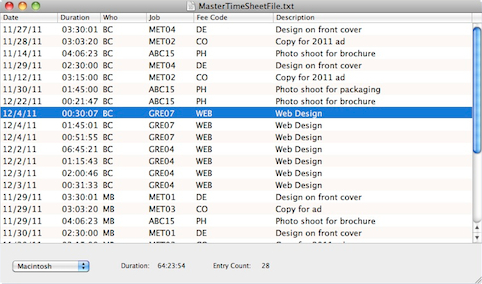 Once a time sheet is imported, it is merged in to a master file with all your other employee time sheets and the manager can begin to sift, sort, filter, group, and track time in any number of ways: by employee, job number or client name, date, task category, even description. You also can filter time reports apart from the master time sheet file allowing you to track, print and export long-term projects or employee productivity-for the day, week, month or year. All reports can be printed and, even more importantly, exported data to tab-separated text files for use in Macintosh OS-X, Windows, or Linux spread sheets, databases, or word processors. 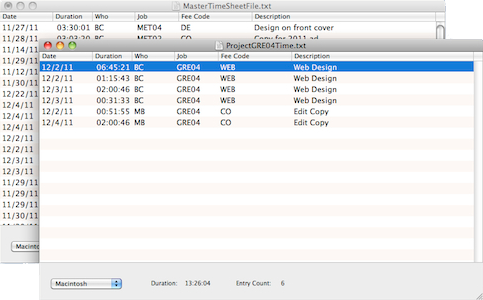 The process starts with everyone in the workgroup tracking their time with our DesignSoft StopWatch software. And then, import the time from time sheets delivered by email or via the network and merged into one master time sheet file which can represent time from the day, week, month, year—or whatever you want! 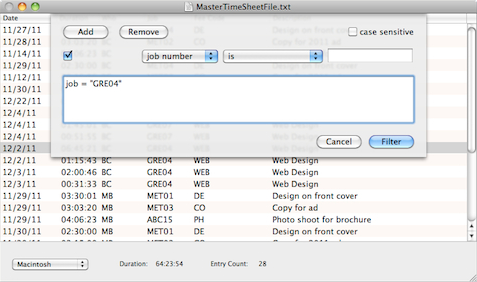 It can then be sorted, grouped, and viewed by employee (above), job, date, fee/time code, description, or any combination. Simple filters (below) help you narrow down the data you are interested in. All screen shots are of version 2 for Mac OS-X.